Balzer + Bray, 9780062839701, 384pp. Now a major motion picture: Love, Simon, starring Nick Robinson and Katherine Langford! 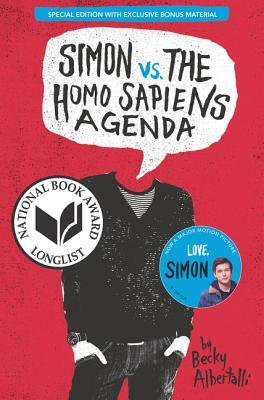 This special edition of Simon vs. the Homo Sapiens Agenda by award-winning author Becky Albertalli includes new Simon and Blue emails, a behind-the-scenes scrapbook from the Love, Simon movie set, and Becky Albertalli in conversation with fellow authors Adam Silvera and Angie Thomas. Sixteen-year-old and not-so-openly gay Simon Spier prefers to save his drama for the school musical. But when an email falls into the wrong hands, his secret is at risk of being thrust into the spotlight. Now Simon is actually being blackmailed: If he doesn’t play wingman for class clown Martin, his sexual identity will become everyone’s business. Worse, the privacy of Blue, the pen name of the boy he’s been emailing with, will be jeopardized. With some messy dynamics emerging in his once tight-knit group of friends and his email correspondence with Blue growing more flirtatious every day, Simon’s junior year has suddenly gotten all kinds of complicated. Now change-averse Simon has to find a way to step out of his comfort zone before he’s pushed out-without alienating his friends, compromising himself, or fumbling a shot at happiness with the most confusing, adorable guy he’s never met. And don't miss Becky Albertalli's The Upside of Unrequited or Leah on the Offbeat! Becky Albertalli is the #1 New York Times bestselling author of William C. Morris Award winner and National Book Award longlist title Simon vs. the Homo Sapiens Agenda (now a major motion picture, Love, Simon); the acclaimed The Upside of Unrequited; and What If It’s Us (cowritten with Adam Silvera). Becky lives with her family in Atlanta. You can visit her online at www.beckyalbertalli.com.